on two field trips learning about Australian Indigenous culture within an educational context...travelled over 3000km via various modes of transport, without leaving my state (50km south to Kangaroo Valley, 850km up north and back down the coastline one night to drop some ferrets to Taree, over 700km each way to the outback town of Moree...then the regular 1500km or so that I drive each day)...Taught four different art classes during a six week practical session as a part of my university studies. I've also been working on the images for Inktober, but haven't had the chance to scan them in yet. Maybe in the next few days...it still xounts as a win if I manage to get all 31 images completed and posted by the end of the month doesn't it. The start of this month has gotten away from me. I've pencilled in some sketchs for Inktober, I've been off on a bushland retreat, I've been woorking on assignments. Time to get back to Inktober properly. I've been instructed by the local Aboriginal community, and by an Aboriginal elder in charge of Indigenous education policy in this state, that I have to finish my game Walkabout. I was given a few indicators of elements that might need to be altered, or at least carefully explained to avoid being problematic, but on the whole, the concept of an RPG exploring Aboriginal spirituality through stories and metaphor was considered exciting. 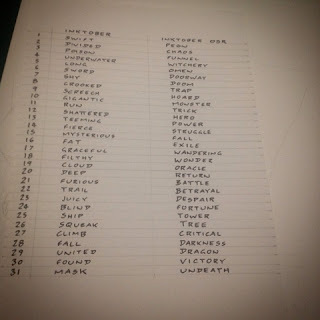 I've combined the lists for Inktober 2017 and OSR Inktober to generate my list of inspirations. I did much the same thing last year, working my way through most of the lost before other projects got in the way. Hopefully I'll get through all 31 this time. D&D 3.0 and 3.5 had complex system resource documents which basically functioned as a non-illustrated, no-examples, fairly-stripped-back version of the rules. D&D 5.0 has a similar document floating around. I never really got into D&D 4, so I don't know if that edition had one. A few other games have system reference documents which function as a way to get third-party developers to create products that remain generally consistent with the rules released by the original publisher. I'm starting the process of looking at various system resource documents, with the intention of creating my own SRD for the game system used in "The Law". So, my questions are... what are the good SRDs around at the moment? What do you think makes a good SRD? I have found John Kim's list of SRDs, but would be interested to hear people's thoughts on the matter. 30. Share something cool you made if you can at all justify it as RPG related. With the Shonen Knife concert this week, and the production of an image to possibly get signed by one of my favourite bands, things have been thrown out of their regular schedule. This has been made even worse by other complications around the house, and generally not feeling well. As a result, this post is two days late. One of the curious things I saw as I was doing research for this picture was the fact that on the Band's bio page, two of the members indicate that they enjoy playing games. No specification as to whether they lay board games, card games or RPGs...but the fact that they indicated game play on their biographical details was awesome in itself. Still, I probably can't really justify this as an RPG related share.